The Beatles remain the most popular rock group of all time, and the story of their rise has been told so often that you wouldn't think that there would be much to add to the piles of existing material, which range from teenybopper mags from the �60s to absurdly arcane academic pieces written purely in the pursuit of tenure. There's even been a good amount of ink spilled on those who played with the Beatles before they were the Beatles�the most famous of these is probably Pete Best, who handled the drumming before RIngo Starr signed on, and who even appeared on a couple of the early Beatles recordings. But prior to Backbeat, a whole lot less was known in the popular imagination about Stuart Sutcliffe, the Beatles' first bassist; it's a tribute to Iain Softley's winning film that he has unearthed a trove of cultural history, and has used that material in the service of a sweetly told coming-of-age tale, one with more than its share of sadness. We all know the legend of John and Paul, Liverpudlian lads who rocketed to pop immortality; but what of John and Stu? Sutcliffe was a painter first, a musician second, and that just so he could hang out with his buddy; his canvases were angry, messy affairs, decidedly influenced by Abstract Expressionism. 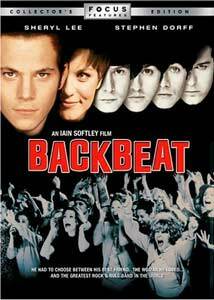 Backbeat begins in 1960 in Liverpool, but most of the story unfolds in Hamburg—Lennon is in relentless pursuit of rock glory, and gets a gig for his bandmates at a dump of a German club. He even gets Stuart to spend the earnings from the sale of his first painting on a new bass. Rock on. As played by Stephen Dorff, Sutcliffe is a delicate beauty and an old soul; still, he's 19, and one of the best things about this movie is the way in which it re-creates time and place, the heady business of being with your buddies, ripping through rock tunes with frenzy, sleeping with all the pretty girls, and fueling it all with fistfuls of amphetamines. It's a movie that makes the Beatles human, and peels away decades of self-promotion and cagily edited and highly selective history. The movie starts as a buddy picture, with Sutcliffe and Lennon at its center, but it soon becomes about a pair of interlocking triangles. Stuart meets Astrid Kirchherr, a strikingly beautiful young German photographer, and her boyfriend Klaus is left in the lurch when she and Stuart begin their romance. More potent, though, is the tug-of-war over Stuart between Astrid and John—there's no suggestion of a homosexual relationship between them (as opposed to, say, The Hours and Times, about the relationship between Lennon and the Beatles' manager, Brian Epstein—curiously, Ian Hart plays Lennon in both movies), but there's a love between these two guys, and it's palpable. Part of the fun of the movie, certainly, is seeing actors playing young versions of John, Paul, and George (Ringo appears only fleetingly), and to hear them rip through covers of Good Golly, Miss Molly and Twist and Shout; but this really is Stuart's story. His relationship with Astrid pulls him away from the band, but you don't get the sense that she's the proto-Yoko, in large measure because he was at best a pedestrian bassist; and Sheryl Lee and Dorff do fine work bringing to life these young lovers. (She spends a lot of time with her clothes off, but you get the sense that that's not to serve the story, but rather an effort to gin up some prurient interest. Lee is very pretty and looks fine; it works.) In truth, the movie sags a little bit when the band leaves Hamburg; we're left waiting for something awful to happen to Sutcliffe, and it does. The Dieter-like aspects of her European social circle and their omnisexual Bavarian nightlife are the least impressive parts of the movie, and the film is at its best when it's not being self-conscious about showing us received wisdom about the Beatles. But it's a pretty stirring story, and even if you're a diehard fan of the Fab Four, will probably reveal an aspect of their origin that you may not have known. Image Transfer Review: A sharp, saturated transfer that looks just terrific; the Lichtensteiny colors of the period are well rendered in the production design and boldly rendered on DVD. Shake it up, baby, now. Audio Transfer Review: The 5.1 track is full of atmospheric touches, but the ambient noise and the accents mean that sometimes the sense of the words get lost. Which is fine, when the band is ripping through Money, but less so when Stuart and Astrid, say, are having a tender moment. Extras Review: Though the packaging makes no mention of a commentary track and the disc's menu says that the track is done solely by the director, he is in fact joined by Ian Hart, who plays Lennon, and (recorded separately) Stephen Dorff. They go over the evolution of the project, which clearly remains close to their hearts; unfortunately, even with three of them, they don't have a whole lot to say, and Dorff at times sounds almost sedated. Softley relates a genuinely moving anecdote: he screened the film for Cynthia Lennon, John's first wife, before the London premiere; she was polite, but that seemed to be about all. The day of the premiere, however, Softley read an interview with Julian Lennon, who said that his mother encouraged him to go see the movie, telling him: "Tonight you're going to meet your father." It's about the highest praise you can imagine for a filmmaker telling a true story, but be warned: the same anecdote is repeated at least three more times in this extras package. A conversation (07m:15s) with Astrid Kirchherr allows us to hear her but not, alas, to see her; this piece is a little too loaded with clips from the movie, but it's a chance to see photographs of the actual Stuart and Astrid from the time of the story, and to see some of Stu's paintings. A package (02m:59s) of two deleted scenes both feature Stuart and Astrid. Softley sat for a 2002 interview (28m:28s) with the Sundance Channel, in which he smartly discusses his quest for authenticity, while not wanting to make a starry-eyed biopic. He and Hart give a project overview (09m:59s) which covers much of the same territory. A TV featurette (11m:59s) produced at the time of the film's original theatrical release includes on-set interviews with principal cast members; you can also see audition tapes for several of them in a series of casting session clips (06m:40s). You'll also find a brief essay on the film by Softley written in January 2003, and a gallery of 20 photographs taken on the set. A deft bit of cultural history about the world's most famous band, and a pretty smart coming-of-age story, as well. It's got to be rock 'n roll music if you wanna dance with me.